This is absolutely the most difficult and uncomfortable time of the year for me to shop. Don't get me wrong ... I love shopping for my nearest and dearest, and delight especially in finding something for the Huz that makes him grin that special grin. But it is also the time of year when I am bombarded by all the neat stuff I've wanted all season! All the luxe goods; the jewels, the shoes, bags, perfumes ... they beckon tantalizingly like sailors' sirens. It's a constant battle with my lower self to avoid coming home with a bunch of bags filled with stuff for dear old Moi. Not to mention how hard it is on my pitiful budget. Bella and a dedicated and fast growing legion of wise women all over the world have dedicated their shopping funds to the ethic of "shopping second-hand first." 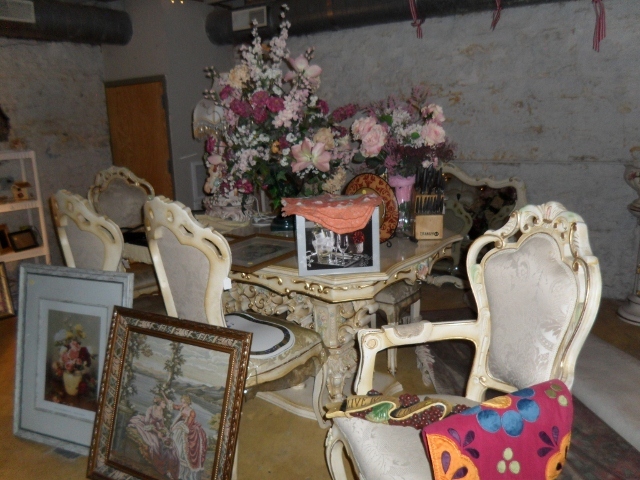 Or vintage, or consignment, but renewing and recycling and up-styling in gorgeous ways that have my constant admiration. But, I had not considered shopping for the holidays this way. 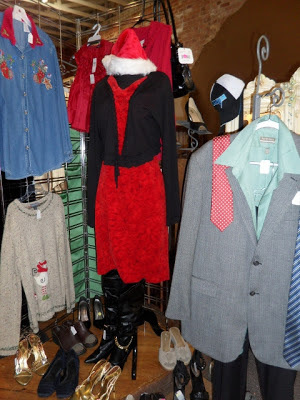 There aren't many shops here that are much more than indoor garage sales, but in seeking them out, I have found at least three pretty snazzy resale shops in Fort Smith that offer holiday-shopper-selfishness-salvation and gifting opportunities as well! Now that I've found these, there are bound to be more! 1. Your girl-friends or family that just live to prowl these places ... Gift Certificates for them! You know them. The ones that always look effortlessly chic and at home in their clothes, and when you complement them, they tell you (smugly) that they got it at a vintage shop for some minuscule amount. 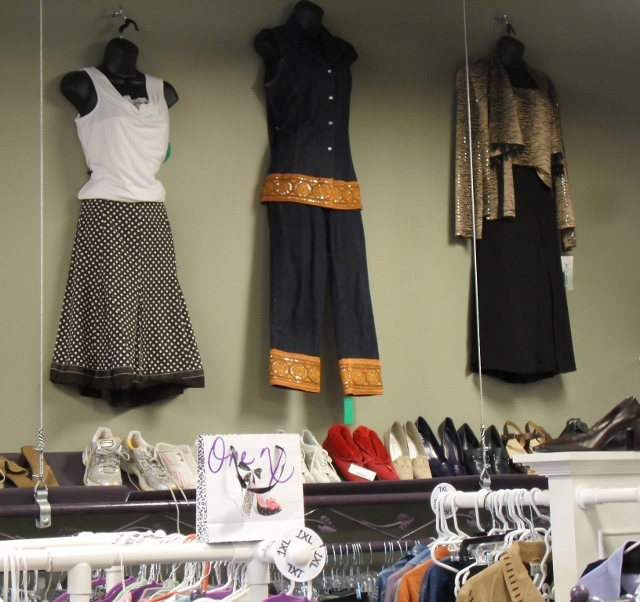 They may be tough to choose specific gently-used items for, but how happy would they be with a gift certificate for their favorite resale shop? Consider ... these certificates can go a very long way in terms of purchasing power, and you are helping everyone involved achieve a more petite carbon footprint. This brings to mind a second category of giftee who might enjoy such a gift certificate. How about one for your adorable and noble ecologically-focused friend or relative for whom every purchase should have sustainability cred? Man or woman, this could work and really be appreciated! 2. Collectors of "vintage" accessories. These women are easier to buy a gift for... the ones who love bangles, brooches, rings, watches, handbags, etc. from any era that is regarded as retro or in any way trendy. Given all the temptation out there to pick up a little something for yourself ... how about splurging on something that catches your eye at one of these places? The damage to your budget and conscience will almost assuredly be less than it might have been, you get an almost guilt-free treat and, as above, you do some good ... or at the very least, no harm. 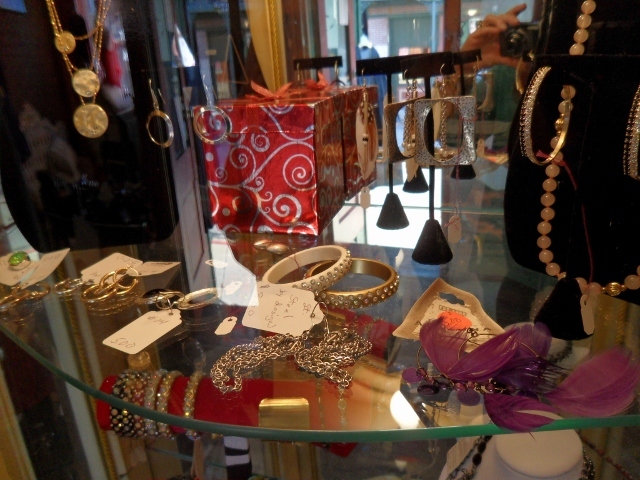 There are cases full of great jewels and accessories, from the merely glitzy and glamorous to the truly grand. In seconds, I'd found half a dozen things I wanted. Look carefully, 'cause solid upscale brands abound, and there are some very pretty things everywhere you turn. These women, led by owner Dawn Howell, know how to merchandise. Just around the corner from Emi-Lee's, you'll find this very welcoming and charming shop. 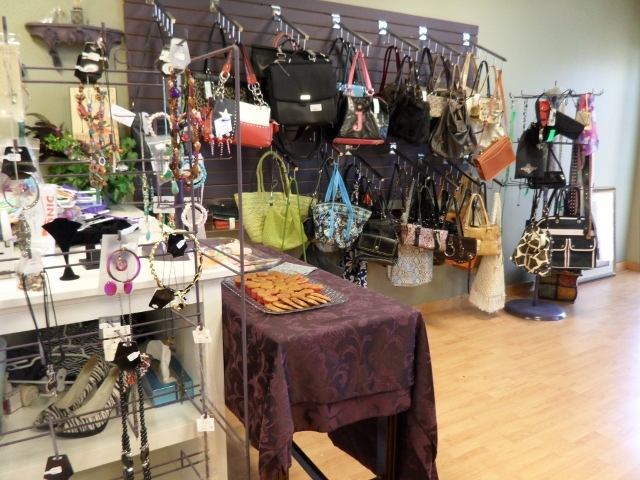 It's full of great finds, and I particularly liked some of the handbags! 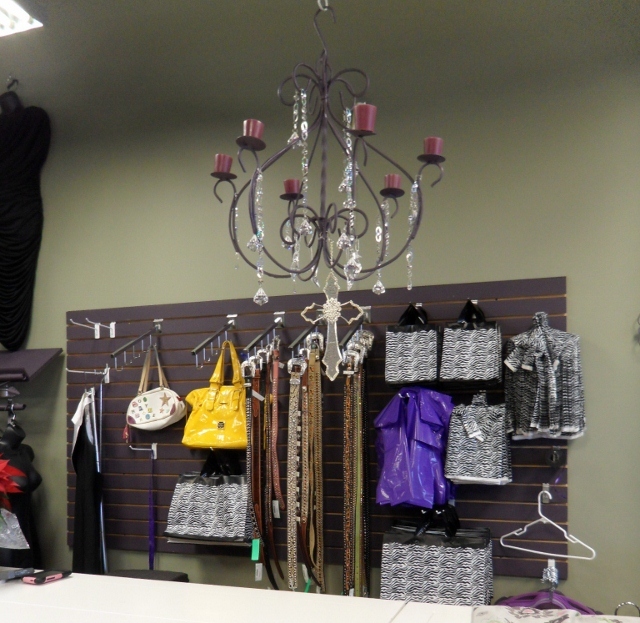 They are both consignment and a boutique, with some great values on makeup items (new, of course.) You'll meet the team, consisting of Desiree Jeffrey (manager-daughter) and Patti Williams (owner-mom) and they'll make you feel welcome. Patti let me know that there is a First Thursday, open-till-8:00pm evening for shops in the area, coming up on December 6th. There will be sales and drawings for Christmas goodies! Here I am, showing them off for Patti's Visible Monday . 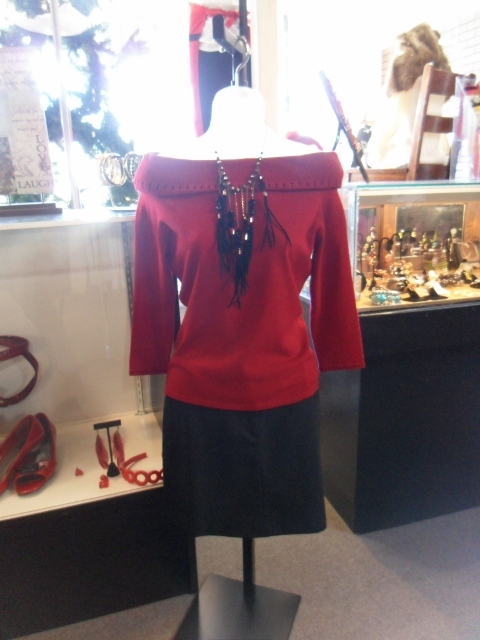 Come see all the stylistas, fashionistas, restylistas and vintagistas in our natural habitat ... the Outfit Photo! Have a great week, and drop a note to let me know what you think about any of the above! Great shops! They really look like treasure caves.. I love second hand shops but unfortunately we don't have such beautiful ones where I live. Thank you for sharing.. This quite a way from where I live, just the biggest town. I'm a transplanted city mouse living here in the country. I don't always shop these places, but I'm trying to do it more, where appropriate. So glad to hear and see that you and the family are doing well. My wish for the coming year is a better one for us all, especially for your part of the world! I think those are great ideas! I'm looking at trying to do most of my Christmas shopping either in little boutiques where the stuff is handmade locally, craft fairs or in second-hand or consignment stores. I love the boots, Jan! Thanks, Sheila. There was a place in Seattle the my husband used to frequent, years ago. He scored a cashmere coat in very nice shape ... we don't find that kind of thing here, or at least often. I miss the city lots this time of year. Any city, actually! I'm going back to your site today to figure out how you put that first outfit together. Beautiful. Thanks for reading, and for your own blogging. Oh all I can think about is the hours of fun to be had rummaging through these places! You have some lovely shops there! I have to say that the Christmas presents I have treasured the most have been vintage items which Mr V and his family gave me. Although they know I love vintage I think it makes a fabulous gift - it is after all something no one else is going to have. Once these things enter your life, they can become almost as dear as family and friends. Not a popular sentiment, but we humans set store by symbols, and these most personal things pack a real emotional wollop that way. I have a horse bridle that I'll never give up ... to many memories. Thank you for reading! Am glad you're back. Great post about second-hand shopping, Jan - I took Bella's pledge too. You have some awesome shops in your home town! Thanks for linking up to Visible Monday. Unfortunately, I'm not able to take Bella's pledge, as I won't always (or even often) look second hand first. But it's a really good idea. These shops are 40 - 50 miles away. As I mentioned, most of our second hand stores are glorified garage sales here. I just really appreciate Bella's dedication, the importance of sustainable living and that these little shops need a boost this time of year. Have a great week, thanks for reading and writing and hosting! 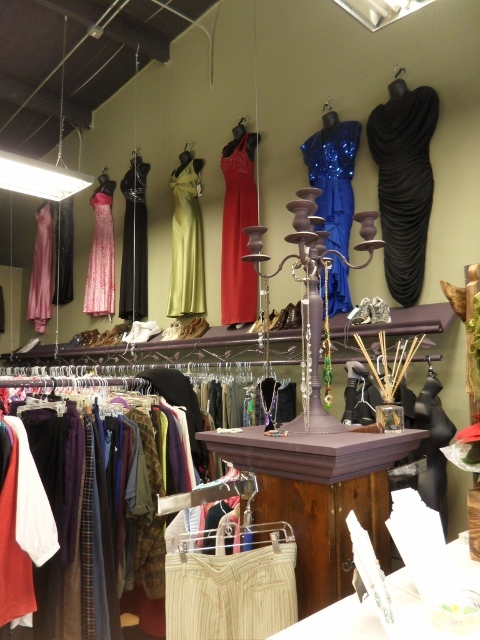 You have so many great boutiques near you, it must be so much fun to spend couple hours with friends shopping there! Your flat boots are great! Thank you, Elena. These really aren't very near, but I go in to town with my husband fairly frequently. I need to go more often. Have a great week, and enjoy your amazing city. 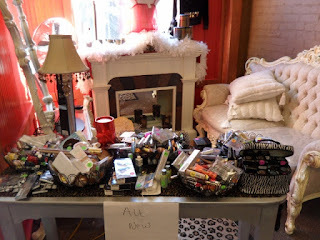 Great post on second hand/vintage stores! There is only one good one near me and I am there pretty much on a weekly basis. I am with you on the gift shopping in department stores. Something about the mix of holiday music, scent of evergreen and gift sets is just kryptonite to my budget! I'm such a selfish cow about this. Probably because it's just the two of us here, and I am a spoiled only-child. These stores are really not near, so I don't get to them as often as I ought. I'm working on walking my talk a bit better, but after I drive all that way, I've used more gas than second-hand is sometimes worth! Thanks for reading, and writing. Wonderful list of resources! I adore vintage shops. Have a date with the huz for tomorrow to go back into Ft. Smith and look for more. (He has to go anyway so we can shop for the pub, so we might as well make a date of it.) This kind of shopping takes a skill I don't have, but am working on it. Thanks for reading, and writing your blog! Well--we've stopped giving xmas gifts (give to local charities instead)We'd rather bless the needy instead of giving family and friends more stuff they really don't need, or receiving gifts of stuff we really don't need. Those shops look AMAZING!! I'd have to travel to Baltimore or Dc (75 miles away each) for anything like that!! (Second try ... sometimes these vanish into the ether.) Giving locally is important, especially this year. Spoiled brat that I am, I want at least a little Christmas, and I love to buy for the huz who never buys anything for himself. I don't live in Fort Smith, but it is my nearest large-ish town. We're about 40 miles away from these stores, and I've never been much of a thrifter. I do think it's important to support them, though, so I am playing local detective to find out where they are and point them out for any readers around here. Awww, it was nuthin', Ma'am. Actually, Dan (the huz) and I have to go into the big city tomorrow and I have another part to check out where I might find more. It's hard here to get people to read local blogs, for some reason, so this is rather falling on deaf ears. But as a tiny-small-biz owner, I know how hard it is during the holidays for some shops. Really, I'm very grateful to have the voices like yours reminding me to walk and talk the same language. We keep the restaurant as green as we can, but it's really difficult here. Too much recycling talk can get you filthy looks. But we persevere. And I love it when someone thinks I rock. Back atcha! Wow, I wish I had those in my area! Thanks for stopping by my blog! And thanks for writing your blog ... enjoyed visiting. Will watch your spot with interest. i wish we had such shops near by, i hardly could resist to stop in every time i am passing. 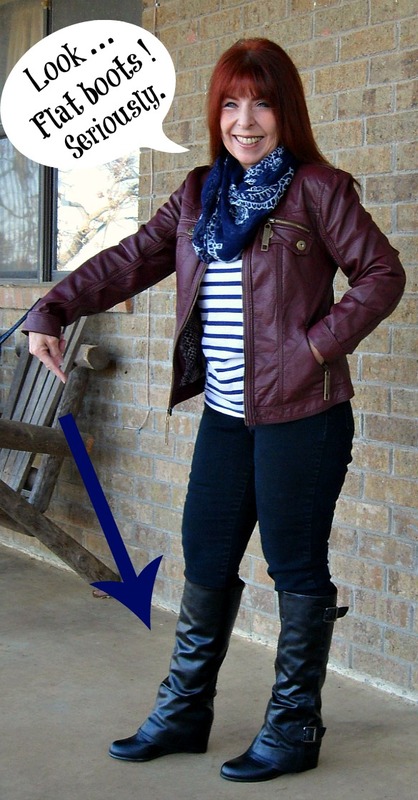 you look great in your beautiful outfit, i love the boots, but the jacket too! Thanks again, Sabine. (Really genius,that first outfit of yours. So beautiful.) I look forward to visiting again soon. You go girl in those faux, flat boots. And that jacket is yummy (if it were edible, I mean). What cool vintage shops! We need more of those neat little places in the 'burbs of Dallas. No character, all new. Blah. None in Dallas? I'm shocked. As I keep pointing out, the shops I've shown are some distance. Not much of a thrifer, but I'm trying to get the hang of it. Thanks for your kind comments. The jacket was a good purchase, and I'm trying to find ways to use the boots more often. I'm in heel withdrawal ... will be tall again tomorrow! 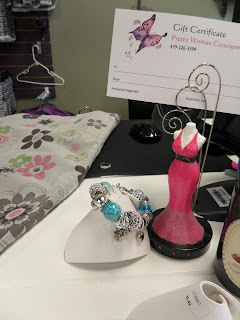 Great ideas on gift certificates for vintage shops and your dedication to Bella! You too, I see are well practiced in the Art of Disguise with your faux flat boots! Well done. Thanks. I'm kind of taken with the idea of gift certificates for my thrifter buds. Thanks for pointing me to the very charming *14 Shades of Grey*. Something new every day! Thanks for reading, and writing! I too, wish we had vintage shops in my city. I can already see quite a few things I'd like just by looking at the pictures. anyway, great blog, would you like to follow each other? Thanks for reading. Most cities have them, but they are often hidden in the funkier and older areas in town. I was just talking about this to my friend the other day, because I had gone thrift store shopping and had seen many items for different friends. I didn't by them because I wasn't sure how they would take getting a thrifted item. My friend said I should have bought it because people always like my thrifted items. These are great tips and suggestions. Your comments you always leave are so thoughtful and make my day, so thank you. Your taste is so excellent, you'll do fine! You could make a big deal of it with recycled or handmade wrap, a loving note about saving the world through thrifting ... frankly, it seems pretty cool to me. Your friend is probably right. Besides, they're your friends, and they probably won't be surprised. Your first instinct was probably the best! Have a great week ... thanks for reading, Carrie, and for your blog. Frankly, there's not much here locally. It's getting better, but here in the fly-over belt, we scramble for shopping, used or otherwise. But our motto is "shop local, think global" and we try. But then, there's my personal downfall and vice: Amazon.com !!! Thanks, darling Sarah, for reading and the kind comments. Can't wait to see what you wear next! I had no idea there was such difference in Goodwill stores ... the one in Seattle was amazing sometimes. The one here in Arkansas is ... well... dreadful. Didn't see your blog listed at VM today ... have to to check again. 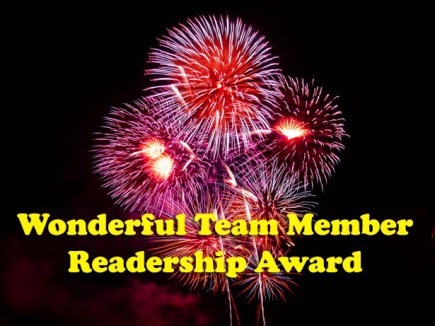 Thanks for reading ... and for writing your blog. Sorry I missed you, Juliann! Have grown to love my boots. It's hard here as it's a thin population, and very low income state. We persevere! Love your photos! Looks like you have some great choices! Yeah ... they came out okay, didn't they? I'm still not much of a thrifter, but I hope I can learn to do more, and be a bit more creative with upstyling. Unfortunately, we don't always get what we hope for. Takes action. Sigh. Thanks for reading, and for your blog! Great shops for recycled treasures! Whoever is on your list is in for a treat. Thank you so much. Sorry I missed you here. Hope you had a lovely holiday and are enjoying the pure potential of the New Year! Not many on my list this year, but it would be a good idea if there were! Really, they're not bad little shops for our area. Thanks for reading, Judith. Hope you're feeling up and jazzy ... you certainly look lovely! Oh my god, the ball gowns! Like all colors of cotton candy! I took the pledge, too, but for gifts I'm going to include hand-made/locally made items. I'm also pondering all the clothes I don't wear and trying to figure out how to sew them into things that I will wear. And I don't even like sewing. Great post - you really did your homework! I don't thrift often, but should, and need to try harder. But I figure the least I could do is try to get the word out. Sorry I'm so late with this reply, Val. Hope your New Year is full of all good things! Really Cute!!!!! Both caps so you know I mean it. Sorry I missed you, Alyssa! Really Flattered ... Thank You!!! And HAPPY NEW YEAR! thank you for your suggestions! I love giving gift certificats too. Oooh, fun shops. Wish we had a few here in our area. I have stopped in to a couple of Goodwill stores with not much luck. Those gals there really do know how to merchandise and display items well and that can be half the allure when it comes to many items. So sorry I missed you, Diane. These places are remarkable partially because, like you, we don't have much here. I'm always amazed at the difference between one Goodwill and another. Hope you have an amazing 2013, and thanks for visiting! Love the boots! You look adorable! So kind, as always. That's so nice to here. Great ideas for the holidays! I don't anticipate coming to Arkansas any time soon, but you never know!! If I do, I'll definitely be checking out the spots you mentioned. They look fabulous. I love your boots, too! Really, there is no reason for anyone to come to Arkansas. Please let me know if your Hubs ever plays anywhere near Western Arkansas. Little Rock, maybe? Dan and I haven't been on vacation in over 16 years, but we might be able to get away overnight someday. Jazz is our fave, but not available much here in live venues! Thank you for everything this year ... enjoy 2013! I can't help but gawp at all those gowns and party dresses. I heard that thrift shops here ship the good stuff to the UK. No wonder it's often slim pickings. Love your boots! That's one thing we do seem to have is tons of prom dresses. I wish I'd thought to do a Tulle and Teacup challenge... there's a use for one or two of them! Glad you like my boots. They're getting some wear. Thanks for visiting, and I can't wait to see what you do in 2013. Ooh lovely post. My sister tells me there is a rule when doing Christmas shopping and that is 'one for you, one for me' which takes all the guilt out of buying nice things for yourself in December. Good, isn't it? 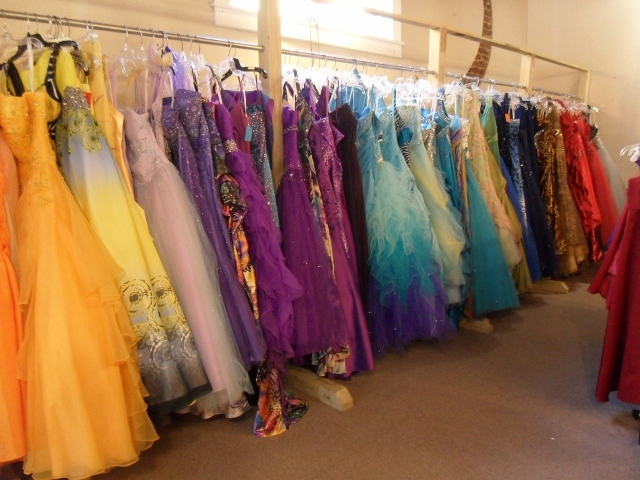 I love that photo of all the prom dresses, the colours are so pretty. Good rule. NO, GREAT rule. I'm going back one of these days. I want a tulle skirt and there looks like lots of potential for re-purposing in the prom-dress section. Thank you ... I've worn them way more than I though I would. I appreciate you stopping by! Hi there!! I love second hand and vintage shopping, so this post was fabulous to read! love your outfit too, very stylish and the boots look great! thanks for stopping by too! Glad to see you here, Jill. 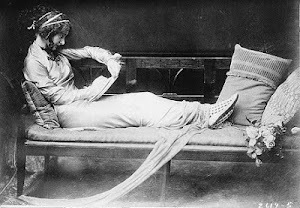 I've been a reader of yours for a long time ... I love the history and exhibitions. Can you tell me, is this very old blog post the first one referred to you by a click or a link? Just wondered, because new folks often come in via this post "portal" and not the current post? Can you give me any information on this? Otherwise ... I'll be reading your blog with enthusiasm! Wonderful post, thrifting is big here in Minneapolis too. Looks like you have some fun places to shopping. Love your beautiful hair with the leather jacket! Thanks for stopping by my blog and leaving such thoughtful comments. Thanks, Ann. For stopping by and for your very sweet comments. Tell me, what brought you to this very old post for a first look? Were you referred by a click or a link? I just find it odd that so many first time readers comment on this post rather than more timely ones. Any info you might provide would help. 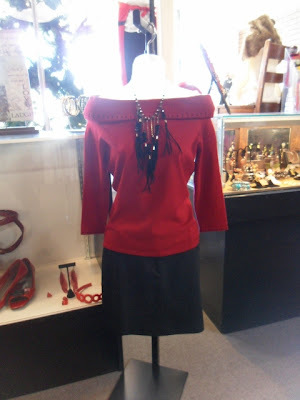 Oh, I love vintage /consignment stores! Last October I went on a rampage at a few when I was in Santa Monica for a holiday.. there are a few shops along the Wilshire Blvd in Santa Monica that sell fabulous second hand items! With that said I found out that vintage/second hand items are not for all.. well, their lost is my gain! Thanks for dropping by my tiny blog, truly appreciate it! p.s. Looking fabulous with that flat boots! Thanks Mrs. C ... I'll be watching your blog with interest in the future! Santa Monica! I'm an old SoCal girl myself from down San Diego way. Can you tell me how you found this particular old blog? Did you find it via a click? It's from last year, and so many new folks come in this way. Odd. Any info you might have would be of help. Hope to see more from you soon! Thank you for stopping by my blog and for your kind words. I had to take a peek at your blog and I just love this post. I'm a super dedicated resale and consignment shopper! Sounds like you have a number of great shops there! Bella's blog is great and I love her commitment to her cause. Well...she has a few causes, so I should say I love her commitment to her causes. She's a gem. I'm glad you lifted her up here! I'm going to be nosing around your blog for a bit...it looks fun! Hey Lisa ... hope you are off enjoying your tour. I'm trying to figure out how everyone is ending up here (this OLD post) via profile clicks, and how to fix it so I'm current. Nose around all you want. It's evolving. Hi Jan - I don't know what took me so long to realize that you have a blog! I would love to do more Thrift shopping but I don't have the patience to continually shop at the stores. It is really about timing and probably knowing the staff is a big plus to getting the good stuff. Thrift stores are the best places to shop. It's wear I find my most treasured pieces. Los Angeles has a lot of thrift stores. If you ever in the area go to Buffalo Exchange, Wasteland and the Goodwill. I'm a SoCal girl myself (San Diego) but sadly, we never get back. We don't have many decent resources here for renewables, but I don't give up hope! Enjoy the brilliant weather I hope you're having! I think it is because of google plus, when I went to yours I clicked the first link like I always do & landed here. I too like these shops!